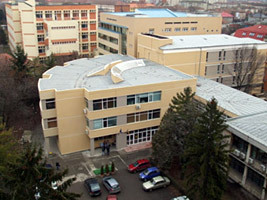 The main seat of the Central University Library „Eugen Todoran“ is located in Timişoara, Romania, Bd. Vasile Pârvan, nr. 4A. It consists of two buildings: A – old building and B – new building. Several faculties of the West University house branch libraries. In the Central University Library documents are organized in collections, branch libraries and special libraries or are stored in closed stacks. The second floor houses the Newspaper Library, where the general-interest journal and newspaper collection is to be found. In the new building users can consult publications of the Library collections organized by study subjects in open shelves, in modern large reading rooms. Ground floor – The Reader Services Office for the readers’ information and registration, where documents stored in closed stacks can be requested. First floor (BI) – The Formal Sciences, Life and Natural Sciences Library with publications of mathematics, computer science, astronomy, physics and geography. Second floor (BII) – The Political and Social Sciences Library with publications of social assistance, philosophy, psychology, sociology, education sciences, pedagogy, special educational psychology, political sciences, commmunication sciences, library and information sciences, journalism, publicity and public relations, European studies. Third floor (BIII) – The Humanities Library with publications of letters, modern languages, classics, linguistics and history. Collections not to be found in open shelves are organized in closed stacks with compact shelves and can be consulted on request. Fourth floor (BIV) – The Fiction Collections Library with books of Romanian and world literature, either translated into Romanian or in the original; and the Special Collections Library with old and rare books, manuscripts, bibliophile editions, autographed books and other format documents.